These nano-satellites are one-third scale replicas of the Sputnik 1 satellite built jointly by Aéro-Club de France, AMSAT and Rosaviakosmos. They were hand deployed from the Mir space station during spacewalks. Sputnik 40 (RS 17a) was launched, along with a backup spacecraft (Sputnik 40-2) aboard Progress-M 36 on 5 October 1997. On 3 November 1997 during an extra-vehicular activity, Sputnik 40 was deployed by cosmonauts Anatoly Solovyev and Pavel Vinogradov. It ceased operations on 29 December 1997 when its batteries expired, and subsequently decayed from orbit on 21 May 1998. Sputnik 40-2 (RS 17b) was launched, along with Sputnik 40 aboard Progress-M 36 on 5 October 1997. never deployed from Mir and decayed with the space station. Sputnik 41 (RS 18) was launched aboard Progress-M 40 on 25 October 1998. On 10 November 1998 during an extra-vehicular activity, Sputnik 41 was deployed by cosmonauts Gennady Padalka and Sergei Avdeyev. 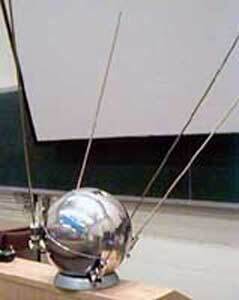 Having ceased operations on 11 December 1998 after its batteries expired, Sputnik 41 decayed from orbit on 11 January 1999. Sputnik 99 was launched aboard Progress-M 41 on 2 April 1999. It was switched off due to a licence issue, when it was deployed, owing to an arrangement with Swatch, a commercial company, for messages to be broadcast from the satellite including a trademarked advertising slogan, a flagrant misuse of the amateur radio band. After numerous protests, it was decided before launch to launch the satellite without its batteries, turning it into a passive piece of junk.